The video was captured the poor little girl who was untreated from the thousand of lice on her head. 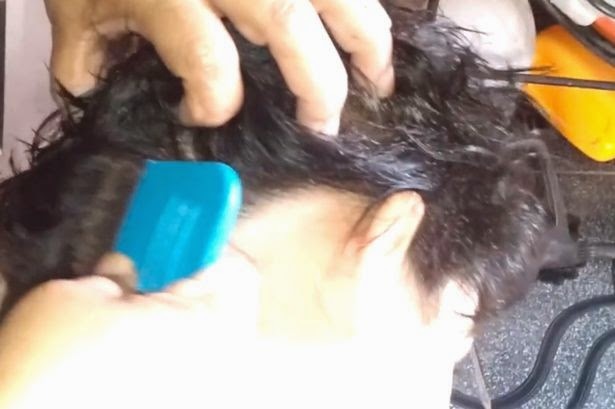 Her mother was combing the hair and dragged the lice out from her hair, it was tagged as the "worst lice infestation" in a person ever. The lice hides on the thick hair of a girl, when the comb dragged out from it, thousand of pale green parasites can be seen on the nit of it. A very disgusting video that will make your skin, and scalp, crawl. How on earth the girl was neglected by her own mother? Hair expert says that the head lice live for approximately 40–50 days and go through 3 stages in their life cycle. Watch the stomach-churning footage shows hundreds of head lice living inside a little girl's hair. There's no enough details on who and where the video was filmed. It was first uploaded to Youtube on August 5, 2013. For more head lice or green parasites related information, Please bookmark this page for updates and you may also share this post to your friends. Comments or suggestions about "WATCH: Thousand of Head Lice on little Girl's hair" is important to us, you may share it by using the comment box below.